South Melbourne, between South Bank of the Yarra River and Port Phillip Bay, originated at the elevated area first known as Emerald Hill, 2 km south of central Melbourne. Emerald Hill, an old volcanic outcrop, stood out from the surrounding swamp land and had greener vegetation. Its elevation above the Yarra delta attracted the initial European settlement. During summer, the swamp land dried out and it could be used for recreation or military training. Settlement south of the Yarra River was focused on Sandridge (Port Melbourne), which was linked to Melbourne by a track from a pier at Sandridge beach. Land sales in today's South Melbourne were few during the 1840s, but in 1852 a survey of Emerald Hill resulted in the auction of subdivided lots. Grants of land were made to the Anglican, Catholic, Presbyterian and Wesleyan churches, and the pick of the blocks was given to the Melbourne Protestant Orphan Asylum. Settlement of Emerald Hill happened quickly and within two years its residents were complaining that the Melbourne City Council was not giving them value for their rates. On 26 May 1855, Emerald Hill was proclaimed a separate borough. At the time of the survey of Emerald Hill in 1852 a temporary township was created west of St Kilda Road, south of the river. It was Canvastown, a low lying area with tent accommodation for gold field immigrants. It lasted for two years and gave its name to the first school (1853) in the area at the corner of Clarendon and Banks Street. Slightly later in Emerald Hill, church primary schools were opened: Presbyterian (1854), Catholic (1854), Anglican (1856) and the orphanages, Protestant (1856) and Catholic (1857). A mechanics' institute was opened in 1857. 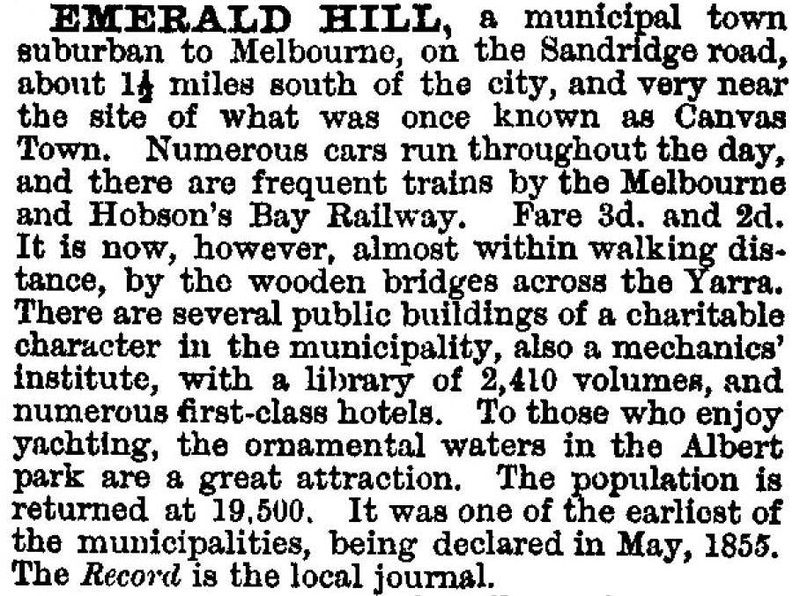 The opening of the Melbourne to Hobsons Bay railway in 1854 did not benefit Emerald Hill very much because it skirted the area, but the Melbourne to St Kilda line (1857) had an Emerald Hill station by 1858. The land around Emerald Hill remained unsuitable for housing or industry until it could be drained. The Victoria Barracks, on higher land in St Kilda Road, was built in 1859, and the military freely roamed the area: rifle butts were in Albert Park and a shore battery was at the end of Kerford Road for the defence of Port Phillip. In 1863 massive floods inundated the surrounding area and the few optimistic infant industries. On 1 March 1872, Emerald Hill was proclaimed a town which led to the council moving its town hall from Cecil Street to the site occupied by the Protestant Orphan Asylum. The orphanage was persuaded to take a larger site at Brighton in exchange, and it retained the balance of the site around the new town hall. Thus the Emerald Hill precinct was formed and kept intact until sold to the State Government in 1973 by the orphanage's successor, the Melbourne Family Care Organisation. While the town hall move was under way, John Danks was mayor. His time as a councillor ran from 1871 to 1880. Danks hardware foundry and supply of plumbing material was a major industry. State schools replaced church schools: the Eastern Road school (1877), the Dorcas Street school (1881), the City Road school (1884) and Montague (1889), all grew to become crowded, as the population of South Melbourne more than doubled in 20 years, reaching nearly 42,000 in 1891. Football clubs were formed in the 1870s and in 1879 the South Melbourne club with red and white colours took its place in the Victorian Football Association. It was one of the founding clubs of the Victorian Football League in 1897. 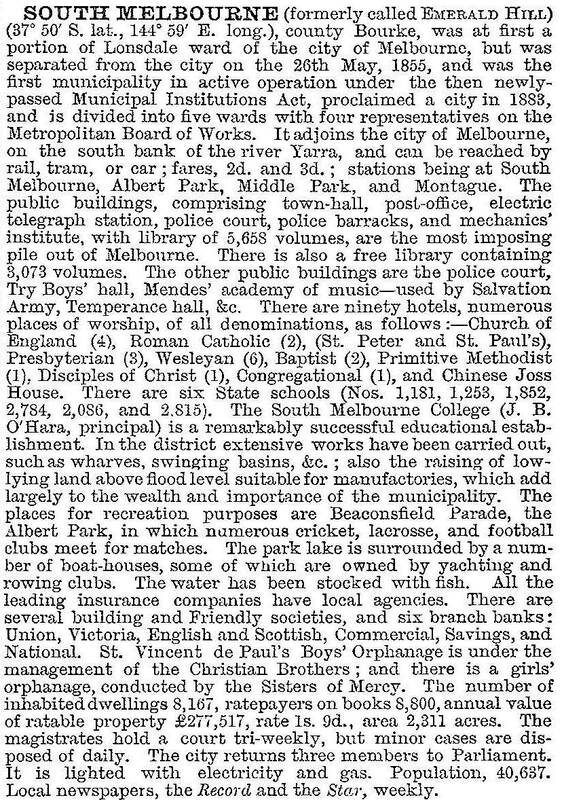 Emerald Hill town changed its name to South Melbourne on 25 September 1883. Tram lines along Clarendon Street and Park Street were opened in 1890, along with the connection made to the city seven years before with a steam ferry between Clarendon and Spencer Street. Manufacturing and food processing industries expanded back from the riverside. The giant red brick Tea House building, originally a stationer's warehouse (1890), is a surviving example in Clarendon Street. Notable food processors were Hoadley's Chocolates (later Allens Sweets) and Sennits ice-cream. In the later era of neon lights the Sennits bear and the flashing Allens confectionery sign became night time landmarks. Textile mills, timber merchants and furniture trades set up in the 1880s. Clarendon Street, in addition to having many food and drapery retailers, had furniture retailers. Maples, Tyes and Andersons began in South Melbourne and grew to become metropolitan chains. Crofts grocers, later a self service pioneer in the early postwar years, also began in South Melbourne. Education broadened to secondary level with a technical school (1919-92), St Joseph's technical school (1924-88) and the conversion of the City Road primary school to the Domestic Arts School (1930). Another was the transfer of the Melbourne Girls' High school to MacRobertson Girls' High school, in a corner of Albert Park, in 1934. From Emerald Hill's beginning with the orphan asylums, welfare has had strong community support in South Melbourne. The Montague kindergarten opened in 1909, along with Methodist and Catholic kindergartens within a few years. Baby welfare and child hygiene centres were opened during the 1920s. When a South Melbourne local, Harold Alexander, was appointed Town Clerk in 1936, the council deepened its interest in welfare activities. The charitable community chest and increased rates from commercial properties help to fund welfare activities. At that time South Melbourne was receiving the first postwar migrants, who increased in the next two decades. Cricket and football was played beside the South Melbourne Hellas Soccer Club (1959), and adult migrant English classes were run at the Eastern Road primary school. Riverside industry expanded, and the Montague kindergarten closed in 1959. Montague was disappearing, but its sons had enlisted in record numbers for World War II, and reportedly had been good fighters. South Melbourne had a strip of land on the west side of St Kilda Road from the river to the end of the Albert Park. Part of it came from severance from the Albert Park reservation in 1875, providing sites for boulevard mansions. Closer to the river there were several institutional land uses: the Homeopathic (later Price Henry's) Hospital 1882, the Immigrants' Home (1852-1911) and the Victoria Police beside the Barracks. On the site which would ultimately be the Arts centre complex there were the Green Mill, Wirth's Olympia and, later the Trocadero and Glaciarium entertainment venues. In the postwar years Melbourne's central business district spilled down St Kilda Road. Land was cheaper and the council encouraged development because it increased council revenue from rates. In 1944 the State Government agreed with South Melbourne's council that the Wirth's circus site should be reserved for a cultural centre. Postwar shortages delayed the project, and the first part of the Arts Centre was opened in 1968. As culture officially came to South Melbourne gentrification came to its residential area. The Emerald Hill Precinct, with the town hall as its centrepiece, is a registered historic area, and inspired conservation initiatives both private and municipal. By 1981 the population was less than half its postwar figure, and local support for the football club had waned. Its premierships had been won in 1909, 1918 and 1933. In 1982 the Swans became the Sydney Swans, and the Lake oval lost its main tenant. (The Sydney Swans subsequently won premierships in 2005 and 2012). The particularly noticeable changes since the 1960s have included high rise Housing Commission flats (Emerald Hill Court, 1962, and Park Towers, 1969), the Westgate Freeway (1975-95) and the development of Southbank. On a smaller scale there were the conversion of the South Melbourne Gas Works to a park (1982) and the conversion of the Castlemaine Brewery to the Malthouse Theatre (1987). In common with inner residential areas, South Melbourne's house prices outpaced the metropolitan trend. In 1987 the median South Melbourne house price was 37% above the median for metropolitan Melbourne, and in 1996 it was 70% above the metropolitan median. On 18 November 1993, the area of South Melbourne defined as Southbank and extending to Docklands was annexed to Melbourne city. On 22 June 1994, South Melbourne city was united with St Kilda and Port Melbourne cities to form Port Phillip city. To guide planning in the area the Clarendon Street Charter was developed by Council and traders, a plan superceded by Council's development of the South Melbourne Central Structure Plan in 2007 covering the future 10-15 years. Other plans subsequently developed by Council provide detail for improvements in the area include South Melbourne Streetscape Masterplan, Emerald Hill Vision and the Emerald Hill Masterplan, 2014. By the 2011 census, separate houses were 19.4% of occupied dwellings in the South Melbourne suburb; row houses were 29.7% and flats and units were 49.2%. There was an increase of about 13,000 or nearly 73% in 20 years.